1993 ford ranger question please help !!! I have a 1993 ford ranger 2.3 and i am wondering if i can fit the k&n 57 Series FIPK cold air intake. The oldest year they have is 1995 ranger 2.3 and i am wondering if it would fit my 93 ranger. Also just to make sure with this k&n cold air intake, it would pass smog and be street legal? Thanks! Re: 1993 ford ranger question please help !!! Yep, that cold air intake is just a waste of money. 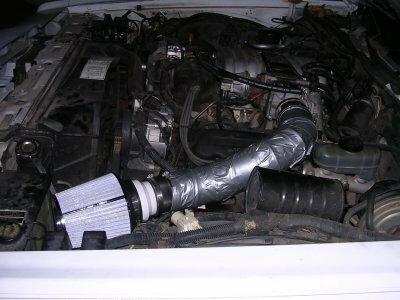 Save yourself some money and make your own custom cold air intake. I don't know how they call these things COLD air intakes when they pull in the superheated air from under the hood. Just a way to take your money. OK - went a bit nuts but it's a serious misleading as bad as any Sham-Wow infomercial. People: Gas/fuel doesn't like COLD air dag nabbit! If too cold it would never atomize (evaporate) to be able to work in time. All sorts of efforts are to warm air not cool it up to putting strong electric heaters under throttle body or carbs then AND run total exhaust heat as well so evaporating fuel (gets cold just doing that like sweat on your skin) can even ice up so it's making itself cold anyway and has to be corrected or you'd just flood out. No clue how these scams get out there and not pulled from the market place instantly? The end all is if any of these tricks worked at all or had any benefit it would be designed into the engines to begin with. Thanks for all the help guys..... Dont really need your guys opinions on them i really didnt ask. You guys seemed to think i did but you all maged not to answer my question and insted just go on a rant about them. This was a waste of time IMO.....looks like I'll have to take this to a better forum. No problem, We won't miss you. Sorry for the harsh approach to what really should be a no brainer and no offence - the advertising is convincing with stuff but real results are so disappointing and costly to buy then don't work and costly to put back to what works! K&N actually has a competitor for this market that's worse! Look up the Uban lore and myths of assorted products. Some you'll find great reviews but miss fine print that it isn't really tested and don't discuss it can also damage things for using them! Guess the budget for something is better spent not telling you that up front. Makes this and other magic-in-a-can products a strong seller for the unwary. It's my/our fault to some degree that it's so clearly corrupted to sell this junk it gets taken out on the buyer who trusts the claims. Graphs probably wont show below and I wont go looking for ones that will but if you really look into results of products of many assorted things never mind a vehicle that took mega thousands of hours to make and design as best as possible or loses a sale of a vehicle when new to another. It's suicide for a company to have an unhappy new vehicle buyer then the icing on the cake is nobody really want them used so really a disaster. On just this air intake search I just did came up with OE air filter results done by real PPM of catching dirt and the CFM impact of air flowing thru filters and what loss would be expected at they were part dirty vs another. BTW in my hunt AC Delco came out on top of most testing! OE replacement stuff no alterations just quality of the product. Changing to cold air just is beyond thinking it thru IMO and experience. Used to back when turn a round lid to an air filter upside down and get a neat carb/air intake roar with a load that did nothing but make noise and trash the filter fast but cost nothing and just put it back on properly was all you had to do so didn't do much harm short of getting a dirty air filter sooner and defeat WARM AIR pick up for cold starts and engine's initial time before whole engine warmed up and ran it's best. Do that stupid trick in the dead of Winter you would have real problems. End all is the change you seek for whatever claimed benefit doesn't work and costs to do it then undo it when you find out. We really (or I was) were trying to warn you of a known failed idea not pick on you at all and did come out bit harsh. Sorry for that. Try it if you want to find out for yourself. Measure before and after real changes yourself and then if you complain to this company bet you wont even get your money back! Good information Tom. Like they say, K&N filters are really only good for filtering out rocks...lol. GM came out with a TSB a while back concerning those filters and how they were causing MAF issues. GM stated they wouldn't honor damage done by using those filters. K and N went bananas over that one. Corporate Bulletin Number 04-07-30-013 will be available in SI on March 18, 2004. DO NOT repair under warranty if concerns result from the use of a reusable aftermarket oiled air filter. Transmission or engine driveability concerns that are the result of the installation of an aftermarket reusable, excessively oiled air filter are not considered to be warrantable repair items. Have you attempted to contact the manufacture to see if that would fit on your truck? As for passing emissions as long as it doesn't disturb how the air flows through the MAF sensor, you should be alright. To confirm, you should check the laws in your state concerning that. This really is an automotive repair website dealing with factory manufacture designed vehicles and systems and how to troubleshoot and repair those systems. When you start getting into the realm of modifications and changes to the manufacture's intended design, you may not get good answers. One good suggestion is to keep the old air intake ducting system just in case you run into issues or you want to sell the vehicle later. This guy is just sucked in by all the hype nonsense and bogus claims. He's spouted off long enough. Time to close this.